This blog post answers questions you may be having about social media – Why do it at all? How do I do it efficiently? There are good reasons to invest in social media, and there is a way to create a credible presence on social media without a lot of time and money. At a recent presentation I gave on social media, one of the attendees commented that he had just cancelled his Twitter account, because he didn’t understand the value of that social media platform account or how to use it. In a LinkedIn discussion group, a participant posted that they had been blogging for six months with no results. 80% of Twitter users have fewer than ten followers says Techcrunch. According to a Technorati study in 2008, the blog abandonment rate is over 90%. So why do this social media thing? Why invest the time and money? Because social media – if done right – can generate conversation about you and traffic to your website. 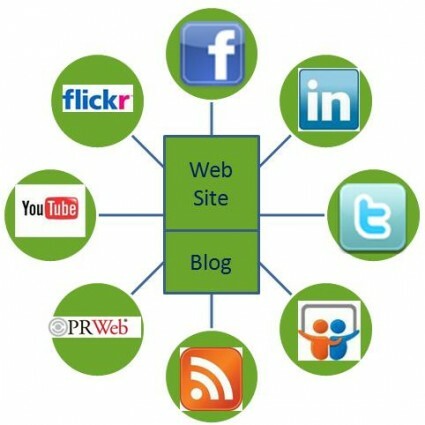 Social media platforms are the spokes that feed traffic to the hub – your website and blog. The search engines are paying attention to social media. It’s not enough to have a website optimized for the search engines. You need to have others comment on your content and share links to your website! How do you have a credible social media presence in a minimum of time? You need to leverage technology. Post a status update on LinkedIn and Facebook once a day. If you blog, make sure when you hit the Publish button, a link to the blog and its title go to each of your social media platforms automatically. If you don’t blog, share others’ content including articles, videos and blog posts. Use a social media dashboard like Hootsuite to manage it all. Make sure all your content and everything you share is tagged with keywords so you get found and followed. Social media is very doable. It requires discipline, but it doesn’t have to require a lot of time. You can have a credible presence online and spend about two hours a week if you blog, Tweet, update LinkedIn, Facebook and Google +. If you don’t blog, your time investment is even less. If you need help getting started or if you’re interested in outsourcing your social media messaging and content, contact New Incite today. We have social media set-up and training as well as outsource services designed to help you. I really like your consistent focus on the efficient use of time and assests. Very important–keep up the good work. Next post: B2B Marketers to Increase Online Content, but What Kind?